Painting by Jean-Auguste-Dominique Ingres in 1806. Certain of mankind's greatest armies have passed like meterors, bursting out of chaos to storm across our history into enduring legend. Some have left us more than a proud tradition; others, a changed world. To the cadenced thunder of their drums they pass, to the lilting of forgotten trumpets, riddled standards high above the Great Captains who shaped and led them: the pikes and muskets of Gustavus Adolphus' tautly disciplined Swedes and Scots, Oliver Cromwell amidst his Ironside horsemen and redcoat infantry,: George Washington's tattered, hard-bitten Continentals; Napoleon's Grande Armee; the lean butternut ranks of Robert Lee's Army of Northern Virginia; George Thomas' indomitable Army of the Cumberland. Erwin Rommel's Afrika Korps and George Patton's Third Army were of their lineage. Napoleon Bonaparte and his mighty Grande Armee were one of the dominant players of the Napoleonic Wars. Napoleon himself showed innovative tendencies in his use of mobility to offset numerical disadvantages, as brilliantly demonstrated in several campaigns. The long series of wars formed an extension of the wars originated by the French Revolution. These wars revolutionized European armies and military systems, and took place on a scale never before seen, mainly due to the application of modern mass conscription. French power rose quickly, conquering most of Europe; and collapsed after the disastrous invasion of Russia (1812), and Napoleon's empire ultimately suffered military defeat, resulting in the restoration of the Bourbon monarchy in France in 1814 and 1815. The victors in the struggle against Napoleon were the Austrians, Russians, British, Prussians, Spaniards and the French royalists. Boney will come and get you !" French cuirassiers and infantrymen captured the Great Redoubt at Borodino. 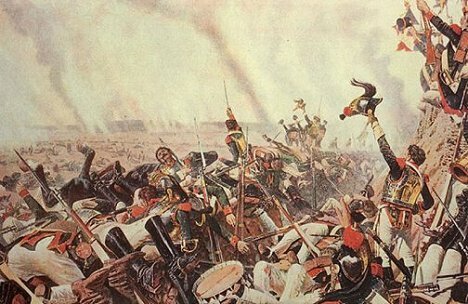 Borodino was the bloodiest battle of the Napoleonic Wars. Napoleon: "Of all my 50 battles, the most terrible was the one I fought at Borodino." Incredible picture by Vereshchagin, Russia. Our website has over 1,800 illustrations, maps, charts, articles about Napoleon's strategy and tactics, about the French, Polish, Prussian, Austrian, Russian and British armies, the Royal Navy, their organization, commanders, uniforms, orders of battles, books, clubs, reenactment groups, Major Sharpie etc. Here are some of the many articles you will find within the website: "The Battle of the Nations", "So which are the best soldiers ? ", "The Cowards at Waterloo", "The cruel war in Spain", "Slaughter at Borodino", "The French Army", "The Russian Army", "The Austrian Army", "Napoleonic Unifors", "Infantry, Cavalry and Artillery Combat and Tactics", web polls, humor and much more. Amateur and professional enthusiasts donate their time and effort to collect and create content that is shared here as a public service. If you would like to share your information, articles are invited. Contributors: Dr. Jean Cerino Badone (articles devoted to the Italian troops, war of the Alps, etc. incl. "Les Compagnies ..."), Dr. Dominique Buresi, A. Nuñez and G. Smith (Spanish troops, Portuguese, Peninsula, Spanish guerilla, incl. "The cruel war in Spain" and others), P. Hofschroer (articles devoted to the Prussian army, Blucher, Duke Wellington, and Siborne, incl. articles "Waterloo - The German Victory", "Prussian Troops and Commanders", etc. ), M. Townsend, Oliver Schmidt (detailed info on the Prussian army, weapons, tactics and organization), Paolo Gerolla (Vienna Congress, Italian troops, incl. "Il Congresso di Vienna"), Jan Kowalik (info on the Polish troops, campaign of 1806 and 1807, photographs), Nikolai Mozhak (Russian generals, Russian army and history), Rémi B. (French troops), Richard Lysiak (Guard chavauxlegeres), Pedro Castilla, M. Ayala (on the Spanish, British, and Portuguese troops), Thomas Mischak and Andreas Hetzert (Prussian troops), Erwin Muilwijk (Dutch and Belgian troops), Z. Olszewski (maps, and several articles incl. "French Infantry, Cavalry, and Artillery", "Austrian Troops" and others), J. Carvalho (tactics, maps, articles, incl. "Bonapartists in Americas"), Giuseppe Rava (Italy), Jason Seigers (article: "Belgians in the French army"), James Mitchell, Jr., and J. Jaye (introduction, webpolls, webmaster). Many thanks to those who sent suggestions, interesting tidbits, photos, illustrations, etc. If you would like for me to add anything to this website, or if you notice any mistake or have any suggestion, please contact webmaster (Please, no genealogy questions). We hope that in 2007 approx. 100.000 people will visit our website. [In the previous years there have been some notable fluctuations in the number of visitors from various countries. For example in 2006 we had quite suddenly a large increase of visitors from China and Japan, while those from Near Asia and from the Arab countries unexpectedly decreased. Consistent numbers of visitors are from Canada, France, Poland, Hungary, Latvia, Italy and the Scandanavian countries. Below is a list of top 30 out of 80 countries (May 2007). Polish Army - Part 1 ~ Polish Army - Part 2 ~ Lancers of the Old Guard ~ "Picadors of the Hell"
Napoleon's Foreign Infantry: Irish Legion, Polish Vistula Legion, The Swiss, Tirailleurs Corses, Tirailleurs du Pô. Russian Army. ~ Russian Infantry. ~ Russian Cavalry. ~ Russian Artillery. ~ Russian Guards. ~ Cossacks ! Waterloo - The German Victory. ~ "Just Don't Mention the Prussians." "Napoleon, His Army and Enemies" is a massive work in progress. but we strive to add new information all the time. We do not sell anything, and we don't advertise. There are currently no plans to introduce a discussion forum to the site.